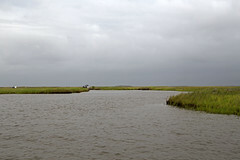 High winds and waves prevent GIWW sediments transported down the Freshwater and Schooner bayous from settling and forming the basis of vegetated marsh. This same wind and wave energy also increases shoreline erosion rates. This project involved the construction of a series of vegetated terraces to diminish waves in Little Vermilion Bay, helping to increase sediment deposition and reduce the rate of shoreline erosion. A pattern of channels was dredged 100-feet wide and 6-feet deep to beneficially distribute sediment from the GIWW through the Freshwater and Schooner bayous. Dredged sediments were used to construct 23 earthen terraces with a combined length of 23,300 feet. After settling, the average height of the terraces was 3.5 feet above mean sea level. The bases of the terraces were planted with 20,450 containers of smooth cordgrass (Spartina alterniflora). The design allows commercial and recreational fisherman to access the project area, and it stimulates fishery production by creating new habitat and increasing shoreline length. In 1998 alone (prior to the project’s completion) 40 acres of wetland habitat were created. This project is located in the northwestern corner of Little Vermilion Bay at its intersection with the Gulf Intracoastal Waterway (GIWW) in Vermilion Parish, Louisiana. The project area encompasses 964 acres. Monitoring is underway and preliminary observations show that the terraces are growing in width, and bay depth between terraces is decreasing indicating marsh expansion in the project area. This project is on Priority Project List 5. According to NOAA, one of our managing agencies, a living shoreline is “A protected and stabilized shoreline that is made of natural materials such as plants, sand, or rock.”  In some situations, living shorelines are a better option than hardened shoreline protection because they have more movement of natural sediment, the ability to grow, and the obvious aesthetic value of a natural area. Vegetated marsh provides similar benefits to artificial oyster reefs and is a tried-and-true restoration strategy. Many marsh creation projects will naturally revegetate thanks to seed banks in borrow sites but some need management to limit invasive species. In more vulnerable sites, CWPPRA actively plants native species like smooth cordgrass and California bulrush to give them an advantage against invasive populations. CWPPRA understands that successful restoration projects, including shoreline protection, help keep ecosystems intact and productive. A changing coast means we need changing solutions, and we will strive to find better alternatives to maintain the natural environment. Problems: There is widespread historic and continued rapid land loss within the project site and surrounding areas resulting from subsidence, wind erosion, storms, and altered hydrology. Land loss data provided by the U.S. Geological Survey indicates that loss was occurring at a rate of 1.7% per year prior to construction. The natural limits of Bayou Dupont were difficult to determine in some areas because land loss was causing a merge of the bayou to adjacent water bodies. Natural tidal flow and drainage of patterns that once existed through the bayou were circumvented by the increasing area of open water. Restoration Strategy: Project goals included: 1) creating and nourishing approximately 390 acres of marsh through sediment pipeline delivery from the Mississippi River; and 2) creating over two miles of ridge (10.5 acres of ridge habitat) along a portion of the southwestern shoreline of Bayou Dupont. Sediment from the river was hydraulically pumped to the project site to construct both the marsh and ridge features and additional material was dredged from Bayou Dupont to cover the ridge. The ridge is designed to mimic the configuration of other natural ridges within the watershed, and includes a constructed elevation conducive for the growth of native vegetation such as live oak, hackberry, and yaupon. The ridge is helping to redefine the limits of Bayou Dupont and reestablish the natural bank that once flanked the bayou and protected adjacent marshes. Location: This project is located within the Barataria Basin in Jefferson and Plaquemines Parishes. The marsh creation area is located along Bayou Dupont southeast of the waterbody known as the Pen. Progress to Date: Construction began in the Fall of 2014 in conjunction with the Mississippi River Long Distance Sediment Pipeline Project (BA-43EB) and Bayou Dupont Sediment Delivery-Marsh Creation #3 (BA-164). Construction of the Bayou Dupont (BA-48) portion was completed in fall of 2015. This project is on Priority Project List 17. Prior to construction, wetlands, dune, and swale habitats within the project area had undergone substantial loss due to subsidence, absolute sea-level rise, and marine- and wind induced shoreline erosion. In addition, oil and gas activities, such as pipeline construction, also contributed to the loss. Marine processes acting on the abandoned deltaic headlands rework and redistribute previously deposited sediment. Fragmentary islands develop due to breaches in the barrier headland. Subsequently, increased tidal prism storage (the total volume of salt water that moves in and out of a bay with the tide) and storm-related impacts have led to inlet and pass formation across the newly formed islands. The Bay Joe Wise beach rim was receded and decreased to a critical width that was susceptible to breaching. Land area in the project area had decreased from 1932 to 2000. Storms occur approximately every 8.3 years along the Barataria shoreline. Because approximately 100 feet of shoreline is eroded with each storm, shorelines of 100 feet or less are considered in imminent danger of breaching. The project’s objectives were: 1) preventing the breaching of the Bay Joe Wise shoreline by increasing barrier shoreline width; 2) increasing back-barrier, emergent marsh area by some 226 acres to maintain the barrier shoreline; and 3) creating emergent marsh suitable for tidal aquatic habitats. The Project features included a constructed beach and dune platform along approximately 2.7 miles of the gulf shoreline. Constructed landward of the beach and dune was a marsh platform with an average width of 860 feet spanning the entire project length. A water exchange channel was incorporated on the western end of the Project to facilitate flushing of Bay Joe Wise through Pass Chaland. The Project created over 420 acres requiring 2.95 million cubic yards of fill dredged from ebb shoal borrow areas. Other project features included installation of sand fencing concurrent with dune construction, dune and marsh vegetative plantings, and post-construction gapping of retention dikes. The project is located in the Barataria Basin, between Pass Chaland and Grand Bayou Pass in Plaquemines Parish, Louisiana. This project is on Priority Project List (PPL) 11. Louisiana Coastal Wetlands Conservation and Restoration Task Force “Pass Chaland to Grand Bayou Pass Barrier Shoreline Restoration (BA-35)”. 2 March 2018, https://www.lacoast.gov/reports/gpfs/BA-35.pdf.